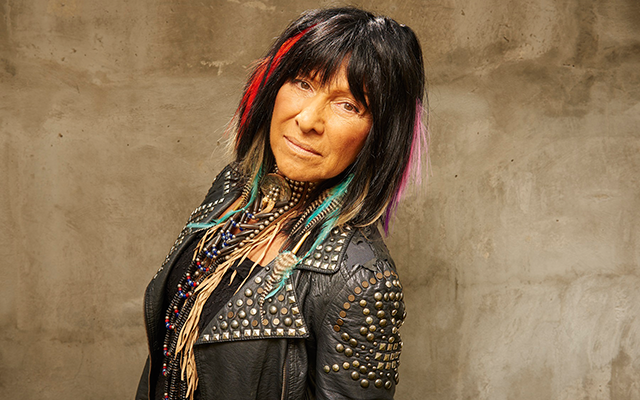 Buffy Sainte-Marie, the iconic singer-songwriter, multi-instrumentalist, social activist, educator, philanthropist and visual artist, has been awarded the 2017 Allan Waters Humanitarian Award, presented by Bell Media. Sainte-Marie exemplifies the essence of humanitarianism through her dedication to protecting indigenous communities and indigenous intellectual property, which have been at the epicentre of her lifelong activism. Sainte-Marie was born on the Piapot Plains Cree First Nation Reserve in the Qu’Appelle Valley in Saskatchewan and grew up in Massachusetts. With a musical career spanning more than 50 years, releasing her first single in her early twenties, Sainte-Marie is celebrated for her thought provoking lyrics and her passion for supporting Aboriginal people. In 1969, Sainte-Marie founded The Nihewan Foundation for Native American Education, a private non-profit foundation dedicated improving the education of and about Native American people and cultures. An important social activist figure in the 60s, Sainte-Marie became well-known for her 1964 anti-war peace anthem “Universal Soldier,” inducted into the Canadian Songwriters Hall of Fame in 2005. Her hit song “Starwalker” from the album Sweet America (1976, ABC), which she dedicated to the American Indian Movement, also marked the first time Aboriginal and pop music were combined, and with Sainte-Marie dubbing it ‘powwow rock’ she created a new genre. The first First Nations artist who has been awarded an Academy Award (Best Original Song for “Up Where We Belong,”) Sainte-Marie is also the recipient of four JUNO Awards, a Golden Globe, the Governor General’s Performing Arts Awards, a BAFTA Award, multiple Queen’s Jubilee Medals and Canadian Aboriginal Music Awards. She carries the Order of Canada and has been inducted into the Canadian Music Hall of Fame, the Canadian Country Music Hall of Fame and Canada’s Walk of Fame. Sainte-Marie has toured the world and her performances have been recognized as must-see events with Billboard Magazine highlighting her “as an exciting contemporary artist of major dimension.” Her songs have been covered by hundreds of artists including Barbra Streisand, Neil Diamond, Elvis Presley, Glen Campbell, Céline Dion, Cher and Indigo Girls. The multi-talented artist has also had frequent TV appearances throughout her career, including a regular spot on the hit television series Sesame Street (1975 to 1980), creating a positive representation of Native Americans among children. Sainte-Marie’s most recent album Power in the Blood (2015) won 2016 JUNO Awards for Aboriginal Album of the Year sponsored by Aboriginal Peoples Television Network and Contemporary Roots Album of the Year, as well as the Polaris Music Prize.